So what exactly is duty cycle transient? There are 3 types of thermal modeling calculations: steady state, simple transient, and duty cycle transient. Steady state calculations provide temperature for a unit which is fully warmed up and has reached equilibrium temperatures. For a simple transient analysis, an electronic unit is initially at some starting temperature. Power is turned on and the unit heats up to reach the steady state temperature. During the simple transient calculation, wattages and ambient temperatures are held constant. For many real world problems, however, simple transient is just not enough. Duty cycle transient is required. As an example, think of antilock brake (ABS) circuitry in an automobile. When the driver of a car hits the brake pedal, the control circuitry pulses the brakes. This causes heat dissipation to rise and fall rapidly. 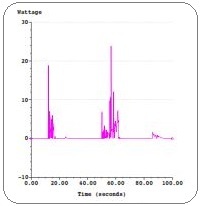 To predict temperatures for an ABS module, wattages must be allowed to vary during the transient analysis. In other words, duty cycle transient is an absolute necessity. There are many other real world problems where duty cycle capability is essential. Frequently, both ambient temperature and heat dissipation varies with time. As most engineers know, duty cycle problems vary widely. Some problems deal with straightforward repeating patterns, such as combinations of square waves and pulses (see top curve on left). On the other extreme, as shown in the lower curve, there are "random power" duty cycles. With random power, the power variation is not easily described and there are thousands, if not millions, of data points. Some duty cycle problems have a duration of several hours, while duty cycles based on millisecond pulses are also common. All in all, there's a huge variation in duty cycle problems. Nonetheless, Sauna provides you with the tools to deal with all of these duty cycle configurations. With Sauna, a basic duty cycle problem can be defined in just a minute or two. To define a square wave, for example, it's a simple matter of using Sauna's menus to define the first pulse, define the second pulse, and enter the total number of cycles. Just as soon as the duty cycle is defined, it can be graphed within Sauna to verify that no errors were made. It's a simple, no-stress method. For more complex repeating waveforms, Sauna provides a powerful scripting language. With just a few lines of script, you can easily define loops, ramps, and other duty cycle variations (see figures on right). Even though the scripting language is easily learned, you can effectively model some very complex configurations. Finally, there are random power duty cycles. For this case, there are no repeating patterns. Typically, the time/power characteristics are measured in the field, or perhaps generated by a simulation program. To handle these problems, Sauna allows for spreadsheet definition of power (tab-separated or comma-separated). If required, you can have more than one million individual power steps. Of course, a large model with a highly complex random power profile can take quite a while to calculate. Simplification tools are essential. With Sauna you can easily simplify an entire randorm power profile, or you can simplify just a portion. With this approach, you can obtain results in minutes, rather than hours. Duty cycles can be applied for either wattage or boundary temperature. There are no limits to the total number of different duty cycles in the model. It's not even necessary to provide duty cycles which share the same time coordinates. Sauna automatically interpolates to add the necessary time coordinates and values. Sauna also incorporates an integrated standby capability so that a duty cycle problem can be started with a steady state analysis. Sauna provides a truly comprehensive set of duty cycle tools. Temperature calculation is another challenge. After all, no engineer wants to wait hours for results. Sauna, always known for rapid calculation times, has a highly advanced temperature solver which has been specially optimized for duty cycle calculations. For many problems, the temperature calculation will take just a few minutes. You should expect that Sauna will be substantially quicker than either FEA (finite element analysis) or CFD (computational fluid dynamics) software. As always, Sauna automatically calculates convection and radiation heat transfer coefficients. Since these heat transfer coefficients are temperature-dependent, it is important to recalculate these parameters during the course of a duty cycle analysis. Sauna does this for you, quickly and efficiently. Once the temperature calculation is complete, the engineer needs to review results to identify maximum temperatures. After all, for duty cycle transient the maximum temperature can occur at any point in the cycle. To provide a complete view of temperature data, Sauna incorporates a comprehensive plotting utility. "Temperature vs. time" data can be plotted on the screen, printed, or exported to other applications (Postscript, BMP, or spreadsheet format). Temperature charts can also be prepared. Sauna provides all the tools you need to interpret and document the results of the duty cycle calculation. Many times, a duty cycle temperature calculation will indicate that temperatures are not at acceptable levels. If this is the case, Sauna has many tools for what-if studies. It's a very simple matter to modify fins, relocate heat sources, change board copper content and much more. With all these powerful tools, Sauna is the ideal tool for duty cycle transient.